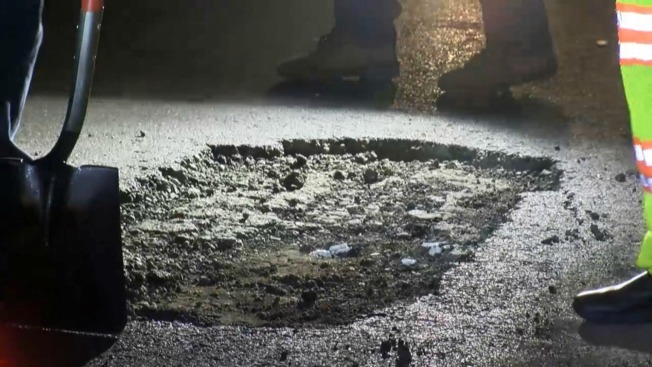 A cluster of potholes on northbound Highway 101 in Palo Alto caused damage to at least one dozen vehicles Sunday night and early Monday, prompting the California Highway Patrol to shut down lanes near Embarcadero for a brief time, according to the California Highway Patrol. About 9:15 p.m., the CHP received reports of a pothole in the far left lane causing flat tires on multiple vehicles, according to the CHP. Police later found several other potholes in the area ranging from four to six feet in length, two to three feet in width and six to eight inches in depth, CHP officer Sgt. Chris Cavner added. The CHP issued a Sig-alert a little after 10 p.m. in order to repair the pothole in the far left lane before blocking another lane to patch up the other hazards. All lanes except the far left lane were reopened about 10:25 p.m., the CHP said. By 3:15 a.m., all lanes were completely open, according to the CHP. Drivers with damaged vehicles can file a claim on the Caltrans website. A large pothole on northbound Highway 101 in Palo Alto caused damage to multiple vehicles Sunday night and shut down all lanes at Embarcadero for a brief time, according to the California Highway Patrol. Bob Redell reports.